I wasn’t impressed with the agent that handled my insurance claim. I asked several times for an explanation of the coverage and the claim process. I got vague answers. So I pulled out my policy and started reading. It’s important to know if you are covered for RCV or ACV.. Generally speaking, the replacement cash value (RCV) refers to the amount an entity would pay to replace an asset. The actual cash value (ACV), on the other hand, is the cost to replace an item, less depreciation and is a lower amount. My policy stated RCV. I hate to admit that I didn’t know what type of coverage I had until I needed to make a claim. I made an extensive list of what was taken. When I delivered that to the agent he told me that he’d give me a check for the ACV amount and as I replaced items and provided receipts for items purchased, they would refund the difference. I called his bluff and told him that if he wanted me to send him 100+ receipts over the course of the upcoming months, a few at a time, I could certainly do that. I asked how, exactly, they would determine the ACV amount? After pushing a bit more, the agent told me they typically wait until a few items are replaced, to ensure the money is being used for actual replacement, then they send a check fort he balance of the claim. Since I pushed, He said he’d send me a check for the entire amount of the claim because “he’d never seen a claim submitted that had as much detail” as I provided.It pays to be thorough. I took up shooting in 2012. Most online sellers will provide older invoices if you make the request. I reached out to Freedom Munnitions about ammo purchases as I couldn’t retrieve older invoices from their website due to a change in their software.They were quick to provide the receipt requested. For the vast majority of the non-gun items in my claim, I just started looking through my purchase history on Amazon and it was a nice reminder of what I’d bought and what to check to see if it was gone. It was easy to do this on eBay as well. For specialty items such as holsters bought from local vendors, I had email confirmation of purchases with prices. As for the guns and magazines stolen? I gave a list of the items to a sales associate at TSA and asked for a quote after explaining why. They were very helpful and that saved much time in gathering information on current costs. I tossed all of this in an EXCEL spreadsheet with links to the source of purchase proof if I had that and a link to purchase a replacement and the cost. The 2nd benefit to this approach was once I had a check from the insurance company, I was able to shop quickly to make replacements. When you start to replace stolen items, you’ll find some things just are no longer available. I had a Kershaw knife that I really liked. It had been discontinued. I found a “blemished’ version for sale on eBay for more than I paid originally. I bought it anyway. The spring wasn’t working right but I lucked out as the local dealer offered to fix that for me at no charge since she no longer had the knife in stock and I had purchased the original from her. I really appreciated what she did for me. After such a bad experience, this was a bright spot in the rebuilding process. The fun began when I found that my UpLula, which before only came in black, now was available in a variety of colors! I opted for bright yellow to make it easier to find in my range bag. That was also a positive discovery during this experience. When shopping for guns, call and compare prices. If you are willing to buy used, ask what is in stock. My #1 priority to replace was my competition gun. When I started calling shops it seemed that every shop I called had a lower price. I found a stellar deal on my first M&P Pro ($425 used). I didn’t find as low a price as I originally paid, but I didn’t have to drive nearly as far this time and I still found a reasonable deal on a replacement pistol. 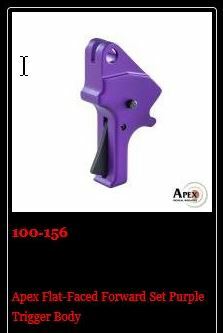 The Apex Trigger I put in my last M&P Pro was now available in purple! I wasn’t interested in a red trigger, because it’s the color of blood and I just don’t want that reminder around my guns. But I was one of the first to buy the purple! I saw it “back ordered” on the Brownell’s site and called Apex to see how long it would be until they shipped. The woman I spoke too said it was so new they hadn’t yet posted it on their own site but they’d be shipping within two weeks. So another upside to all this trauma, is the really cool looking purple trigger in my replacement M&P Pro. I’ll provide before & after pictures in the next blog post. I kept my range cards in my Range bag. It was a nice set of memories. Anytime I visited a new range and need to get a card to shoot at the location, it went in the bag. They were all taken, of course. So I made visits to the Wake County Range and to TSA to get replacements. Both locations made the process fairly easy. I’m still struggling with the fact that being a firearms enthusiast made me a target for thieves. It tarnished the feeling of empowerment with a dose of victimization. But mostly I hate the fact that this experience made me question that someone I call friend did this to me. The police asked repeatedly if I suspected who did this? I had no idea, but it made me question all of my friendships, if briefly. They asked who knew I was out of town? All my co-workers as well as several friends. I’ll never know the who or the why. I calmed down and made changes to my home security. But I really do resent the fact that someone made me doubt those I care for most. Just over a year ago (September 2016), my home was burglarized. I went to Chicago for two days on business. I arrived home after 10 pm. I was tired and just wanted to drop my luggage and sleep. I came in the front door and immediately noticed that the house wasn’t the way I left it. You just know. At first I thought someone was playing a prank, because nothing seemed to be missing on the first floor. Then I noticed the back door was cracked open. And I got scared.I didn’t get to sleep until hours later. I’m not going to described the process of discovery, fear, sadness and grief that followed. It’s like picking at a wound that hasn’t ever quite healed. What I do want to do is share some things I learned in the aftermath. And yes, I have taken safety precautions in case the thief decides to return..
Police deal with the theft of guns seriously, but not urgently. I called the police and an officer and arrived to assess the situation. He called in CSI and she dusted for fingerprints. She was kind enough to tell me how to best clean the mess she was making. My prints are on file due to my concealed carry permit, so in theory they could rule out my prints and ask me about any other prints found. They never did and to be honest, I’m not sure they ever processed the prints they took. When I asked, I was told there was a back log for processing. The only information the police officer wanted the night I reported the theft was the serial numbers of the firearms taken. They were in a spreadsheet on my laptop. That was also taken. I did have data backups but no computer to use to pull the data until the next day at work. The police report listed 23 items stolen: laptop, guns, knives, pistol magazines, holsters, custom shooting lenses, and ammo. Lots of ammo. The police were not interested in a complete list. They wanted items with serial numbers and that were related to weapons. In contrast, the claim I submitted to my insurance company listed 149 entries. The police told me that there appeared to be a gun pipeline up I-95 to New York. The last few guns they had recovered were all found there. The detective that took my case called with additional questions. He and another officer came to my house a few days later to examine the route of entry and a quick walk through to see where items were taken. There was on follow up call to ask questions to attempt to link this to like crimes, but there didn’t seem to be a link. He asked if I shot at Triangle Shooting Academy? Yes, I did. Then he wanted to know if I have gun decal or stickers on my car. In that case the answer was a firm no. That ended that line of investigation. The detective called after 90 days as a final follow up to ask if I’d recovered anything. He marked the case as inactive at that point. I asked several times if they felt there was any chance my items would be recovered. I honestly wanted to hear, “Not really, You should plan on not seeing any things that was taken again.” It would have helped get to closure faster. Instead, I heard, “we just do not know, It’s possible.” which is true but wasn’t really helpful to me. It’s been over a year. At this time, nothing has been recovered. Save brass casings, label them, and save them separately from your guns. The CSI asked if I had brass casings that could be associated with the stolen guns. It turns out they have a voluntary program to collect casings shot from stolen firearms. They use the casings to track / determine if the stolen weapons are used in other crimes. I had never heard of this program. I did have quite a few casings but they were all mixed together with other brass I collected at various ranges, so even if I wanted to provide casings, I couldn’t. The brass casings that came with the guns I bought were in the carry cases with the firearms and were also stolen. Any safe is better than no safe. I had a loaded gun in a small safe by my bed. The safe was bolted down. I know they saw the safe because they snatched two loaded magazines and a tactical flashlight that was next to the safe. I didn’t check it until the police officer arrived. I asked him if I could open the safe and disclosed what was in it.. He told me to open it up and it was just as I’d left it. 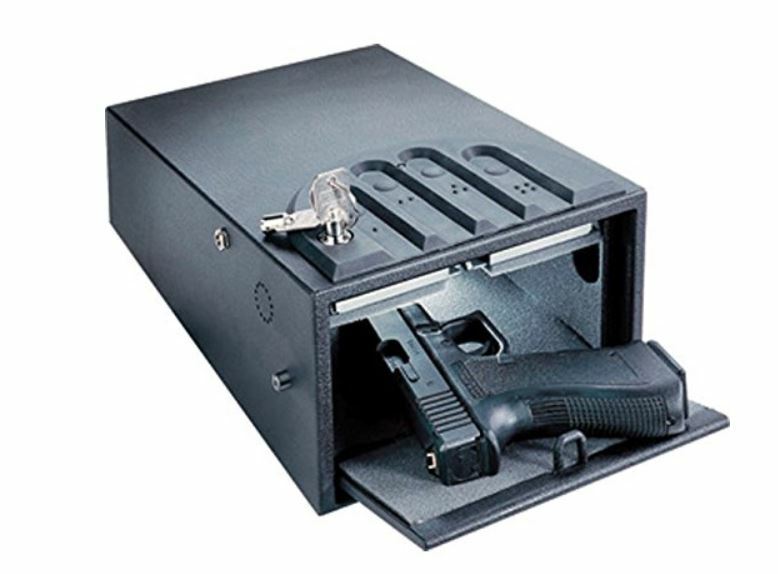 The safe: Gunvault GV1000S Mini Vault Standard Gun Safe for $99. I had recently placed a large order for ammunition. When I find a good price I stock up. I had stacks of boxes filled with 9mm rounds. I had also been camping the weekend before and after returning from that trip, left a large black duffel bag sitting out in the room with the ammo. The duffel bag was gone and I’m sure they loaded it with as much ammo as they could carry along with everything else that was missing. But I still had some boxes boxes left. Can I just say I hope the weight of the ammo they snatched caused injuries as they attempted to carry it away. And I’m guessing the Lands End duffel carried it all with no problems. It was bomb proof and I really miss it. The next post discusses the insurance claim, replacement & aftermath. I saw this on Triangle Tactical today: LAW OF SELF DEFENSE SEMINAR. I bought the book and I’ve been listening to his podcasts. Every gun blog I read endorses Andrew Blanca as current and informative. I’m going. Go to the post at Triangle Tactical to get their special code for a $10 discount. Register before April 3rd, and assuming the seminar isn’t full, you can attend for $89. I have the book so it’s time for a re-read. I think it would be best to come with fresh knowledge so I can pick up the next level of detail from the seminar. I also see this as an opportunity to connect with others locally who are interested in this subject including local lawyers.